Sumitomo Rubber Industries has Completed the Acquisition of Micheldever Group Ltd. 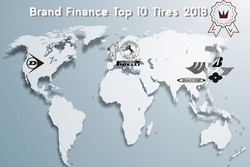 According to the last report by Brand Finance, the British independent branded business valuation and strategy consultancy, the top three leaders 2018 in the ranking of the world’s most valuable tire brands remained unchanged: Michelin, Bridgestone and Continental held their ground. In addition to calculating the value of a brand, Brand Finance also defines the brand’s strength, risk and potential, relative to its competitors, by using a balanced system of indices pertaining to market investments, equity capital, and business effectiveness. Alongside the revenue level, the strength of a brand is a key factor for increasing the value of a brand. This year, Michelin again retains its title as the world’s strongest tire brand with a Brand Strength Index (BSI) score of 86.30 out of 100 and a rating of AAA despite a 9% decrease in brand value to US$7.2 billion. Michelin is the only brand in the ranking to score an AAA rating and its BSI is also higher than the second-ranked Bridgestone, with a BSI of 78.10 out of 100. Top ten ranking of the world’s most valuable tire brands. Brand Finance, 2019. The last year saw a significant shrinkage in the tire sector, reflected in the rankings showing that seven out of ten tire brands lost in brand value. For example, the brand value of Continental fell down 28% to US$3.4 billion, Goodyear down 10% to US$1.9 billion, and Hankook down 8% to US$1.5 billion. This trend can be explained by market uncertainties and a drastic change in customer demands. China, the world’s biggest car market, has experienced — for the first time in 20 years — a sharp downturn in car sales. Additionally, some experts say, consumer behavior has shifted, with more customers favoring retreading as opposed to brand new purchases (retread tires are growing in popularity thanks to their cost efficiency, environmental friendliness and quality performance). The pending threat of American restrictions on foreign import competitors is also a matter of concern, as the industry is bracing itself for President Trump’s proposed 25% tariffs. The latter was commented upon by Alex Haigh, Director of Brand Finance: «Brands in the replacement auto-parts industry — from tire component makers to local garages — are bracing themselves for President Donald Trump’s tariffs on imported Chinese materials and goods. Hefty levies have already amplified the costs of steel and aluminum products, and more tariffs could affect a whole range of other items these companies develop and sell. The bulk of this will be felt in the year ahead by those dealing in tires, rear-view mirrors and windshield wipers». Italy’s Pirelli and Japan’s Sumitomo are the only two tire brands in the rankings to see significant increases in brand value, up 6% to US$1.6 billion and up 33% to US$801 million respectively. Pirelli and Sumitomo’s impressive results are driven by their commitment to diversification and their efforts to differentiate their brands from competitors. Sumitomo has significantly increased its sales revenue over the last year, reporting a 16% rise, which was boosted by the acquisition of UK-based wholesaler Micheldever Tire Services Ltd, strengthening its position on the European market. Sumitomo has also been working with Dunlop (brand value up 1% to US$2.0billion) to open a new European Development Centre focused on product innovation and tire development. Pirelli is positioning itself as a premium and powerful brand, renowned for its partnership with the Formula One World Championships to sponsoring wider sporting events including football, baseball and sailing. This strategic diversification combined with its strong Italian heritage has resulted in the successful differentiation from its competitors, and thus a boost in brand value. Brand value is understood as the net economic benefit that a brand owner would achieve by licensing the brand in the open market. Brand strength is the efficacy of a brand’s performance on intangible measures relative to its competitors.